When it comes to the world of Anime, Attack On Titan has been somewhat of a rising star in the past year or so. Its popularity in its native Japan, as well as throughout the world, has been on the rise, and its upcoming film adaptation is only a further signal that the Titans are truly among us. This probably explains why one of the cast photos features a girl whose love interest is of a higher caliber than any mere mortal. Short version: this girl looks a little too friendly with her weapon. 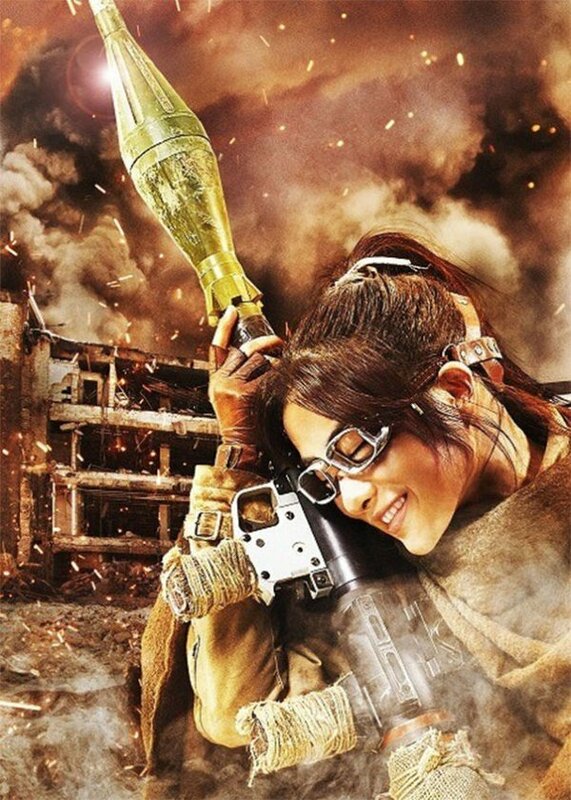 Tokusatsu Network ran the entire line of Attack On Titan cast posters today, and out of all of the shots of young actors to play the various roles the show has to offer, the one that really stuck out in a crazy anime sort of way is that of cast member Satomi Ishihara, who's playing the role of Hange Zoe. Don't let the picture fool you, though, as Hange isn't just some weapon crazy trope of a character. In fact, Ishihara's character is more complex than you'd think with such a telling image. In Attack On Titan, Hange is a character that's actually big on scientific curiosity. In fact, she's excited about any sort of Titan attack because it means another opportunity for her to research them. That being said, the photo isn't a total stretch from her character, as these positive attributes are offset by a certain recklessness she can exhibit if she gets too excited about her work. Long story short, this picture shows off one face of a multi-faceted character. It just happens to be the most interesting facet of the character, poster-wise. If Attack On Titan's success as a film matches that of the anime series that is broadcast on Adult Swim, this could open the door for projects like Death Note that Hollywood has been waffling on. Unfortunately, while it would be a positive thing to see anime projects cropping up in mainstream cinema, there's also the chance that we could have projects like the white washed version of Akira coming back to haunt us. Or worse... Marvel Studios might actually be inclined to visit the possibility of adapting the Attack On Titan/Marvel Comics crossover event into an actual living, breathing motion picture. No need to be too afraid just yet, as Attack On Titan won't hit Japanese theaters until Summer 2015, and there's no telling when it will hit any other country's shores. At the very least, we can expect an exciting (and probably batshit insane) trailer to drop in the coming months. If there's any true test as to how exciting Attack On Titan will be, it will most assuredly be how the Titans look versus the human characters, rocket launchers or not.